So you want to create a cool social media cover, a poster or a card, but have no idea how to use Photoshop? Then you should head over to FotoJet.com because this website makes it easy to create designs, make collages and edit photos even if you have no design experience. And it’s free to use. FotoJet is a Web-based collage maker, basic design tool and photo editor. It’s great for those who don’t have any design experience or those who want to whip something up really quickly. Basically, FotoJet has dozens of different templates, elements and fonts you can use, so designing an Instagram post or a Facebook cover becomes a breeze. It also has lots of different filters you can use to touch up your photos to give them a professional look. 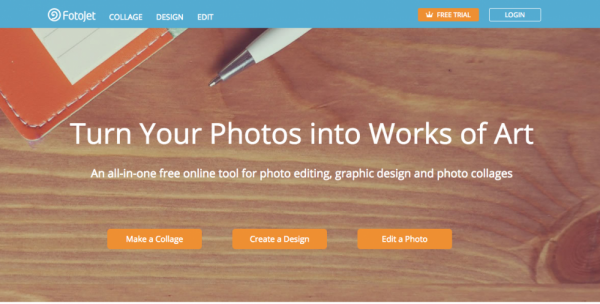 FotoJet is primarily a tool to create collages for free. When you visit the website, simply click on the “Make a Collage” button and FotoJet’s editor will load. There you’ll be able to select a template for your collage. You can choose between a classic grid, a creative template (including Art, 3D, Modern and Poster) or create a photo card. Once you select a template making a collage for free is really easy – just add your photos and other elements, for example text. If you want to create designs with FotoJet, head over to the “Designs” section, select a template and make an awesome Facebook cover photo, Twitter header or other graphics. The design options are somewhat limited compared to other online tools like Stencil and Canva, but what’s there works well and is easy to use. Editing photos is also easy and fun with FotoJet. There are all the options you may need like colour enhancements, exposure corrections, focus shifts, dehazing and more. You can upload your own photos to edit or experiment with FotoJet’s demo photos to get familiar with the tool. Now, it’s free to create collages and designs with FotoJet, but you’ll see that some elements are marked with a premium icon. If you want to use these premium elements and get access to other premium stuff, you can register and get a free 7-day trial. FotoJet is extremely easy to use. Even your grandmother would be comfortable using it. It’s very intuitive and there are helpful tips that guide when you make a collage, a design or edit a photo. FotoJet is a great website for those who want to create a collage for free, design attractive social media graphics and easily edit their photos.